… at some of Wall Street's biggest firms, including Wilshire Associates, which provides services to clients in 20 countries, representing assets totaling approximately $8 trillion. 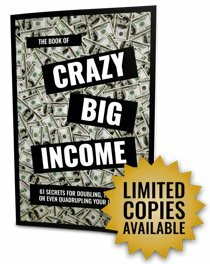 Today, he's giving away free copies of his new book, "Crazy Big Income," which contains 61 secrets that can help you double, triple, or even quadruple your monthly income. For example, this book will explain how you could start receiving checks for as much as $1,267 per month for the next eight years directly from U-Haul. U-Haul is one of America's most iconic companies. Its shares go for $300 apiece on the regular market. And yet, the company pays almost no dividends. And they'll send you HUGE interest payments – as much as $1,267 per month on average for the next eight years. You can start with as little as $100… and rest assured that it's all backed by a reliable American company that's been crushing it for the past 65 years. But I'll show you how to do it on page 59 of your FREE copy of "Crazy Big Income."